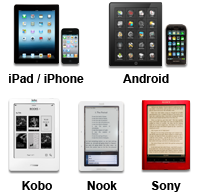 You'll need Adobe Digital Editions software to read an Adobe DRM e-book, which can be downloaded for free at adobe.com. PLEASE NOTE: Adobe Digital Editions does not currently support read aloud capabilities. E-books must be downloaded within 14 days of purchase. You can download your e-book .acsm file up to four separate times on different computers. The link to do so will be accessible in the My Account section of this web site, or from the confirmation e-mail we send you after your purchase. Once downloaded, an e-book file (Adobe PDF or Adobe e-Pub) can't be simply moved to a different computer. To do so, you will need to use ADE and the Adobe ID that was used to authorize that computer. You can copy/paste up to one full page of text of your e-book, for a total of 15 pages per year. Diagrams, figures, and artwork from the e-book can't be copied and pasted. For further assistance, please go to www.wiley.com/techsupport or call (877) 762-2974 (8 a.m. - 5 p.m. EST, Monday - Friday).